Okuye Farms’ history dates back to 1907, three years after Japanese immigrant Kyutaro Abiko bought 3,000 acres in the Merced County community known as the Yamato Colony. Abiko divided the land into smaller plots and sold them to other Japanese immigrants, including Paul Okuye’s grandfather. Paul and his three siblings were raised on the farm, and they eventually inherited it. Following his brother’s death in 1980, Paul, who is an agricultural biologist, and his wife Jean, who taught piano at the time, moved north from Montecito to assume control of the farm. When Paul died in 2001, Jean took over the operation. Since then, their daughter and son-in-law have joined the family business. 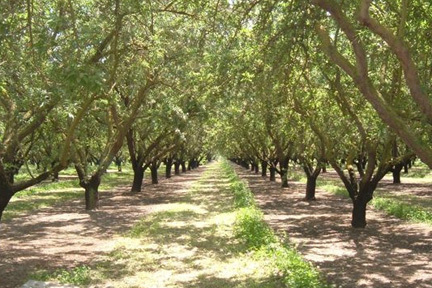 Okuye Farms has grown several crops, but is now solely dedicated to almonds. In total, it covers 80 acres, 73 of which are planted. Environmental stewardship is very important to the Okuye family. They are conscientious about water use efficiency, energy efficiency, and greenhouse gas emissions. “Energy is right up there with water in terms of what we should be saving because we are polluting our air, especially here in the [Central] Valley,” says Jean. She is also worried that urbanization in her area will eliminate farms. Okuye Farms operates using Biologically Integrated Orchard Systems (BIOS) techniques to reduce its dependency on synthetic pesticides and fertilizers while sustaining productivity. Jean uses compost, maintains cover crops (crimson clover, in particular), plants mustard to support bees, landscapes with drought-tolerant plants, installs owl boxes to combat gophers, and limits her application of harsh chemicals. To increase water efficiency, the Okuye’s are replacing their solid-set irrigation systems with drip, which Okuye explains saves water, especially in the almond orchard. Okuye was an early adopter of solar energy, and Okuye Farms is currently fueled almost entirely by solar power. The family installed its first solar unit in 2007 and another one in 2013. Okuye thought the payback period on the first unit would be roughly seven to nine years, and she was right. “It was a no-brainer to me because once it is paid off, it is supposed to last 25 years,” she said. Since then, Okuye Farms has installed four more solar units, one on the small straw bale house where Jean lives. The solar-powered house stays cool during hot days without air conditioning. 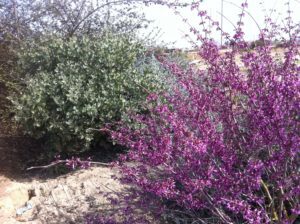 Eight years ago, Jean established a hedgerow using sage, manzanita, lilac and other plants. She installed a drip system to irrigate it, and beneficial insects and wildlife have flourished as a result. “After two years, we water it maybe once a summer, and the maintenance is next to nothing,” she reports. Jean is keenly aware of the development pressure that is imperiling agricultural land in the Central Valley. “The land is cheap, and developers are buying it up. People can live over here and work in the Bay Area or Silicon Valley. I foresee us having a lot of ranchettes,” she said. “I am one of those that wants to see our Valley saved.” Eight years ago, the family put a conservation easement on Okuye Farm to preempt development. In 2004, the Okuye family endeavored to transition to organic farming, but uncooperative weeds made organic farming untenable. “[I] found I would have to hire someone to manage weed control, and I felt it was not profitable,” said Jean. She employs chemical herbicides like gramoxone, although tries to keep them to a minimum. “It is just economical to do so to control weeds,” she says. Installing solar panels in an almond orchards presented a challenges. Not only do the panels take up space that could otherwise be used to grow crops, trees shade the panels, and connecting the system to the Internet can be expensive. No matter the location, Okuye points out, solar inverters, which convert DC electricity to AC electricity, are subject to environmental conditions and require frequent maintenance. Okuye Farms had to replace three inverters within eight years of installing its first solar panels to the tune of $7,500. The hedgerow has certainly enhanced biodiversity, but it’s not without problems. It attracts house sparrows that eat almonds. Overall, though, Jean is in favor of keeping it: “I think it’s really good because there are a lot of beneficial insects,” she says. The upfront costs of switching to solar energy were significant to the family. Jean says Okuye Farms’ initial 15-kilowatt solar unit cost $142,000, although a rebate reduced the amount to $98,000. The system saves the farming operation $6,000 a year. Jean says, “The only thing I spend is a little on maintenance.” Okuye champions solar energy and recommends farmers give it a chance in order to diminish their greenhouse gas outputs.